Woman looking in a mirror. Dry shampoo is the saviour of the busy woman - it's the force behind countless memes, running jokes and quite frankly, hiding your laziness from the world for another day. Without it, festivals would be a helluva lot more unpleasant and washing your hair every day is optional rather than a necessity. But like all good things, it might have to come to end as women are complaining that dry shampoo is giving them bald patches and thinning the roots of their hair. In a piece for The Atlantic, writer Olga Khazan said she began using dry shampoo more often than the regular kind to save time in the mornings and she noticed her hair began to thin at an accelerated rate. "Gradually, though, I began to notice something disturbing. The two sides of my hair looked like they were slowly drifting away from each other at the part. 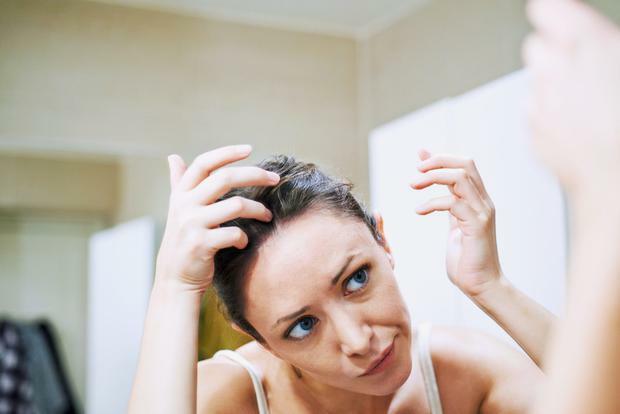 Granted, it’s hard for me to tell when my hair is thinning," she wrote. "I am half Scandinavian, and nowhere is this more evident than my scalp, which, with its sparse, wispy growth, conjures the snowy white tundras of Lapland. "Still, a few dozen strands would defect from my head and onto my fingers each time I showered. It was a lot, even for me." Khazan isn't the only one to notice a correlation between dry shampoo and hair loss. A 21-year-old woman in Belfast's post went viral earlier this year claiming she was left with bald patches. "My scalp was also very itchy and flaky," Nicole posted. "I had wee red sores and blisters all over my scalp and a terrible burning sensation all over my head, to the point where I would wake up several times a night due to the discomfort and pain." After six weeks of washing her hair the old fashioned way, her hair had returned to normal. “[Dry shampoo] deposits substances to coat the follicle that can build up. The resulting inflammation can weaken the follicles and increase shedding. So next time, you're thinking of bragging about only washing your hair once a week, maybe think twice.